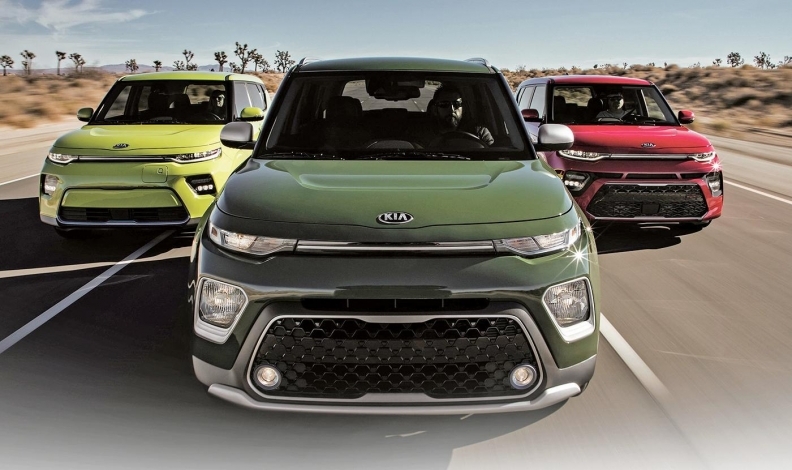 2020 Kia Soul variants are, from left, the EV, rugged X-Line and sporty GT-Line. LOS ANGELES — Volkswagen Beetle. Porsche 911. Ford Mustang. Kia Soul? Those nameplates have probably never been on the same list, but Kia Motors America COO Michael Cole thinks they have something in common: distinctive designs that are instantly recognizable. Although the Soul’s design is polarizing, Kia made sure to guard the vehicle’s quirkiness with the third generation. That uniqueness, Cole said, is a strength that should be protected. The 2020 Soul rides on a new platform and gets sleeker headlights and more sculpted lines, but designers made sure to preserve the boxy looks that some consumers love and others sneer at. While other boxy designs have come and gone — Scion xB, Nissan Cube, Honda Element — Cole said the Soul has built longevity through loyalty. The Soul, he says, has earned the highest loyalty marks of any Kia nameplate. Through the years, its versatility has allowed it to make a play for consumers in the compact sedan and small crossover segments. The marketing was a highlight as well. The lighthearted, hamster-led ad campaigns over the years gave the Soul extra sizzle, says Doug Wilson, a Hyundai/Kia dealer in Flowood, Miss. Even with the dancing hamsters anchoring the Soul’s youthful advertising, the vehicle has drawn a following among baby boomers. Kia wants to keep the boomers around, but Cole believes the latest-generation Soul can expand the net to more young buyers with the new GT-Line and X-Line models. Comparing the 2020 Soul to a chameleon, Cole says it can be a sporty option with the GT-Line’s 201-hp turbocharged engine, or even get work as an adventure vehicle with its X-Line, which offers a rugged body kit featuring body cladding, oversize fenders and off-road-inspired accents. The Soul comes with a larger front grille, slim daytime running lights and 3D wraparound boomerang taillights. The electric version, packed with a new 64 kilowatt-hour battery and zippier ride, has a closed grille. Kia said the battery range is still being determined. A new 2.0-litre, four-cylinder engine is available and it can be matched with the new intelligent variable transmission. A six-speed manual transmission is another option. The Soul offers safety features such as forward collision avoidance, lane-keeping assist, lane-changing assist and driver attention warning. The 2020 Soul, slated to arrive in the first half of 2019, comes as U.S. and Canadian sales lag for its predecessor. Canadian sales of the Soul are down 4.9 per cent to 10,602 units through the first 11 months of 2019. Only the Forte is more popular among Kia cars. Soul deliveries in the United States have dipped 13 per cent this year through November to 94,581. Cole said the exterior styling has “grown up a little bit,” and the ride and handling are a big step forward. But it’s still a Soul.